The Buy Tighe knife takes the Nirk Tighe to the next level with two NIRK locking blades, precision crafted by Brian Tighe. The Buy Tighe folder was a hit at the 2012 BLADE Show, winning the Most Innovative Custom Design. 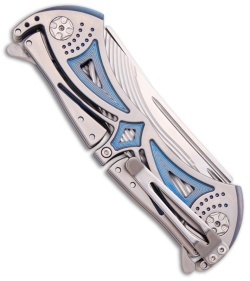 This knife has a titanium handle with blue anodized recesses. The stainless steel pocket clip is right hand tip-up carry. 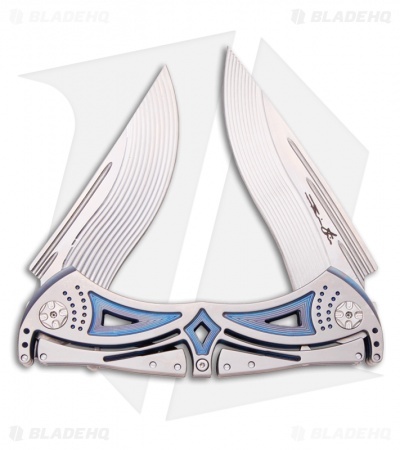 The blades are fluted stainless steel with flippers. The blade is marked #3. Comes in a padded nylon pouch. Blade Lengths: 3.5" & 4"